Patrick Edward's mother is known as a monster all over town. One day, Patrick's mother sends him out to get strawberries. On his way home, three bullies steal the strawberries. Monster Mama is so upset that she teaches the boys a lesson, and they think of her as Cool. 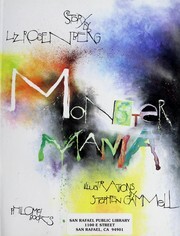 Rosenberg, Liz, “Monster mama,” Children's Picture Book Database at Miami University, accessed April 21, 2019, https://dlp.lib.miamioh.edu/picturebook/items/show/6002.